1933 - The party led by Adolf Hitler won the German election of March 1933. After winning through the democratic process, Hitler proceeded to concentrate power in his hands until he soon effectively had a dictatorship. 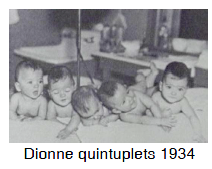 1934 - The Dionne quintuplets were born in May in Callander, Ontario. The wonder of five little girls being born in a single birth helped take people's minds off the grimness of the depression. Over three million people came to look at them and several books and films have since pointed out how they were exploited for the profit of others. 1935 - The "On-to-Ottawa" trek was begun in Vancouver by men from the relief camps of B.C. 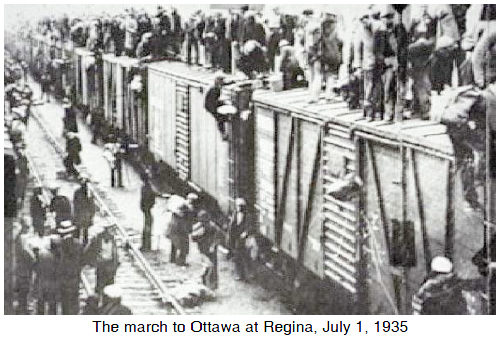 They jumped on freight trains, planning to make their way across the country to Ottawa, where they wanted to protest the government's use of relief camps or "slave camps" as they called them. Their leader was Arthur "Slim" Evans. When the trekkers reached Regina in June they were stopped by police and only Evans and a few others were allowed to go on to Ottawa where they met a stoney-faced Prime Minister R.B. Bennett. When Evans was later arrested, riots broke out in Regina. Some people feared the Communist organizers of the trek. Relief camps were opened in 1932 and run by the Department of National Defence. Unemployed men were sent to the camps where they had to work building roads and digging ditches for 20 cents a day. Originally these camps were designed to hold 2000 men, but the numbers grew to 20,000 before this unpopular plan for dealing with unemployment was stopped in 1936.